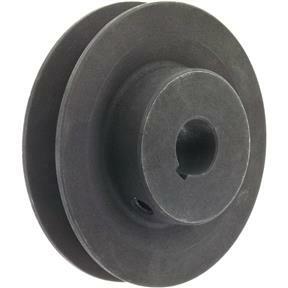 Machined to exact tolerances and balanced to reduce vibration, these solid cast iron pulleys will make any power transfer system run smoother & quieter.Features:Solid Cast IronKeyway & SetscrewFor 3L-4L "A" beltsStatic BalancedPitch Diameter: 3"Bore: 5/8"Standard Keyway W x D: 3/16" x 3/32"
Purchased this as replacement for table saw drive motor. Very sturdy and a high quality piece. If you need a replacement or have a new application I would recommend this part. Actually it was on back order. I just received it. I have not used it yet.